Compressed Gas Technologies Inc. has launched the HPN PSA Nitrogen Generators(Pressure Swing Adsorption) high flow nitrogen generators. The new HPN series is designed for large flow applications. HPN PSA nitrogen generators use pressure swing adsorption technology to produce an uninterrupted supply of gaseous nitrogen, on site. This compact system is ideally suited for high flow applications that presently employ liquid nitrogen bulk delivery systems. With the HPN, the inconvenience of daily, weekly or monthly deliveries is eliminated. Nitrogen is generated at your location, continuously and reliably, requiring only a supply of compressed air. 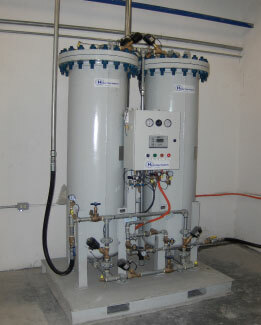 Read more about our HPN PSA nitrogen generators.